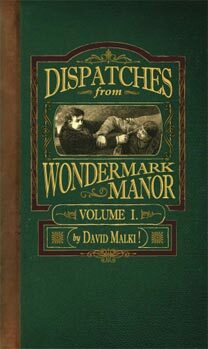 The readers of "Wondermark" will be glad to learn that a prose volume by the same author has just been brought out. The selections are thirty-one in number, and have a quaintness which is genuine and charming. It is needless to say that these have been among the most popular tales that have lately been written. The present collection shows that the author can be successful in other milieux than those which have gained him so much critical praise and such wide popularity. 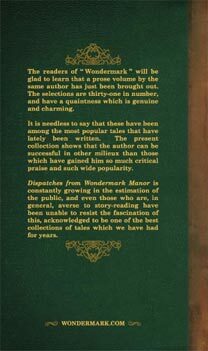 Dispatches from Wondermark Manor is constantly growing in the estimation of the public, and even those who are, in general, averse to story-reading have been unable to resist the facination of this, acknowledged to be one of the best collections of tales which we have had for years.